The Elephant Skin Coral is a curious looking stony coral, with an attractive ruffled surface! The Elephant Skin Coral Pachyseris rugosa gets its name from the "wrinkled" look of its surface that is similar to an elephant's skin. The coral has an uneven skeletal surface that looks like it is almost ruffled with deep grooves and valleys that twist and turn. They have a very thin tissue that covers the skeleton, which can be bluish-gray to brown. Under bright lighting they can be a fluorescent greenish brown. It is also known as Corduroy Coral, Castle Coral, and Groove Coral. In the wild, the Elephant Skin Coral lives in large colonies that form mounds over 26 feet (8 m) across in shallow areas with turbid water. They grow in bifacial plates that are generally upright, contorted, and irregular. These corals are unique, in that they have no discernible polyps. They use the nutrients in the water as well as the zooxanthellae in their bodies to nourish themselves, and can also use a mucous net to capture small particles. The Pachyseris genus are for advanced aquarists due to their stringent requirements. They need a lot of nutrients, yet at the same time need pristine water conditions. They appreciate high light and a strong water movement. They are slow growing and If not kept in pristine conditions, will quickly deteriorate. They are susceptible to white-band disease and other afflictions, and don't tolerate the typical treatments used for other stony corals. Captive reared specimens may be slightly easier to care for. The Elephant Skin Coral has been reproduced in captivity, though in a limited capacity. Propagation has been slow. There has been limited success because this coral heals slowly and stresses easily. Distribution / Background Pachyseris Coral Information: The Elephant Skin Coral Pachyseris rugosa was described by Lamarck in 1801. Some common names they are known for are Elephant Skin Coral, Corduroy Coral, Castle Coral, and Groove Coral. They have reproduced in captivity, and limited captive propagation has been practiced. Currently the Pachyseris genus and the Pavona genus are the only 2 genera regularly offered to aquarists from this family, Agariciidae. Where Pachyseris Corals Are Found: The Pachyseris rugosa are found from the Red Sea to the Marshal Islands, Samoa, and Micronesia, as well as the Great Barrier Reef to the Houtman Abrolhos Islands of Australia. Pachyseris Coral Habitat: P. rugosa are found in deeper waters, as well as shallow areas with turbid water. They inhabit reef slopes, surge channels, and shallow lagoons. They live in large colonies that form mounds over 26 feet (8 m) across in the shallower areas, as well as smaller colonies throughout their range.They are found at depths down to 131 feet (40 m). These corals use the nutrients in the water as well as the zooxanthellae in their bodies to nourish themselves, and can also use a mucous net to capture small particles. Status The Pachyseris rugosa is not on the IUCN Red List for Endangered Species. Description What do Pachyseris Corals look like: The Elephant Skin Coral Pachyseris rugosa growth form is in bifacial plates that are generally upright, contorted, and irregular. It has an uneven skeletal surface that looks like it is almost ruffled with deep grooves and valleys that twist and turn. They have a very thin tissue that covers the skeleton, which can be bluish-gray to brown. In bright lighting, they can be a fluorescent greenish brown. It is unknown how long they live. Difficulty of Care Pachyseris Coral Care: The P. rugosa is a very difficult coral to care for. This is a coral for advanced aquarists. They need a lot of nutrients, yet at the same time need pristine water conditions. They need high light and a strong water movement. They are slow growing and If not kept in pristine conditions, will quickly deteriorate. Captive reared may be slightly easier to care for. Foods / Feeding Pachyseris Coral Feeding: In the wild, small polyp stony (SPS) corals have developed several feeding strategies. Through a symbiotic relationship with a marine algae, known as zooxanthellae, they receive the majority of their nutrients. They also capture planktonic organisms, food particles from the water column, and can absorb dissolved organic matter. In captivity, the Pachyseris corals primarily use their zooxanthellae for nutrition, and can also use mucosal capture techniques. Direct feeding will not benefit this coral, but proper water flow will help it to feed. Aquarium Care Pristine tank conditions are typically needed to keep all SPS corals. Keep the nitrate levels low, and maintaining calcium and alkalinity levels. Typically you can do water changes of 20% to 30% a month, 15% every 2 weeks, or 5% a week for SPS corals. The 5% a week also seems to really make a big difference in the corals health. Calcium: 385 to 425 ppm. If a small poly stony (SPS) coral does not have enough calcium, it will not grow. Strontium: Strontium (10 for most SPS Corals), and trace Elements are also suggested. A well-feed live rock/reef environment is what is needed for your Elephant Skin Coral, along with some fish for organic matter production. These corals are slow-growing and can succumb to disease, a mature tank is recommended. When positioning your Pachyseris, keep in mind that lighting rather than food is more important to them. Strong water movement is also needed for a healthy Pachyseris. Make sure that no other corals can come in contact with your specimen. Pachyseris spp. are generally peaceful but will loose any chemical warfare with other species. Compatibility and Social Behaviors The Pachyseris genus are generally peaceful since they do not have tentacles that extend. It does well in a typical small polyp stony (SPS) coral tank, but will suffer in crowded tanks. It should be kept well away from other corals. They are fine with fish that are considered reef safe. Breeding and Reproduction The small polyp stony (SPS) corals are male and female and can reproduce both sexually and asexually. In the wild they reproduce sexually by releasing eggs and sperm at the same time, resulting in a fertilized egg which then forms into a free-swimming planula larva. Eventually the planula larvae settles onto the substrate, becoming plankters. This then forms a tiny polyp which begins to excrete calcium carbonate and develops into a coral. Planula larvae are extremely vulnerable to predation, and very few survive. The Pachyseris genus reproduce asexually as well. In the wild Pachyseris spread from breakage due to storms and fragmentation. The P. rugosa has been known to use asexual fragmentation, yet this takes many weeks. Propagation for the P. rugosa has been slow and with limited success, since this coral heals slowly and stresses easily. It can easily be cut off of a mother colony that is healthy and has had a chance to grow itself out for many months. Keeping the water in the tank very clean and pristine will help this coral heal if fragging is in its future. Bone cutting implements or scoring can be used to get fragments. Allow the frags to heal before moving them to a new tank. Give the frags ample water flow. Potential Problems The Pachyseris spp. tend to be the first to bleach out in the ocean, indicating their sensitivity to water conditions. They tend to get white-band disease and treating the water is not suggested, yet putting the antibiotic directly on the coral is the best choice. If not kept in pristine conditions, they will quickly deteriorate. 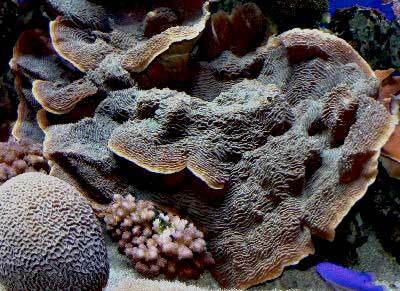 The Elephant Skin Corals do grow very slow, and do not have polyps that can warn you of illness. The only way to tell if it is healthy is if there is no tissue degeneration. If your P. rugosa has any kind of tissue recession, you may be able to get ahead of it by cutting off some of the healthy tissue just beyond the deteriorating tissue This will ensure if any deterioration is starting on visibly healthy tissue, it will not spread. If you have problems with cyanobacteria or algae, keeping strong water movement will prevent them from attaching to your Pachyseris. Availability Pachyseris Corals for Sale: The Elephant Skin Coral P. rugosa is moderately hard to find at pet shops, but can be found online at times. Online they can run about $49.00 USD or more depending on size and/or color.